Coach your people, don’t boss them. When you think and act like a coach: you set goals; build champions; and create high performance teams. Anticipate challenges and prepare for them through appropriate training and mindset. Recognize good performance and good attendance and you will get more of both. Don’t spend too much time on the bad performers. Establish clear expectations with your people, your colleagues, and your boss; negotiate everything. Repeat the above until done. Recently, my colleague Lutz Holfield encouraged me to think about what I did differently to be successful in my career. He asked me what advice I could share with others. There are six ingredients needed to bake championship. They are delivered in two stages: MINDSET and ACTION. Perception, Frame, Attitude, Consensus, Plan and Checklists are not applied sequentially, but as a mind map mobile, forever shifting in the random winds of chance. Each one subtly influences the others. 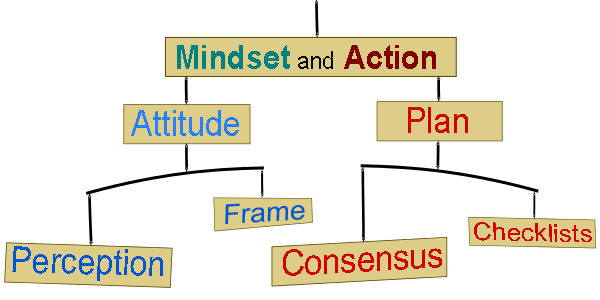 MINDSET – How we think: our attitude, perception and frame of our thoughts. It’s not what happens to us, but how we think about what happens that is important. Throughout my career, it was the positive, creative seeds planted by my parents that directed my actions. My mom taught me to believe in the unique talents of others and to recognize and appreciate their contributions. My dad taught me to decide on a goal and develop a process for attaining it. Both taught me that if unexpected obstacles arise, take a better path. They formed my attitude, developed my perceptions and exposed the value of frames for my thoughts. My practices taught me the rest. As a pilot, I learned how checklists ensure safe and effective actions. As a leader, I learned to appreciate the exponential power of a focused team of unique talents. As an entrepreneur, I learned to recognize what people want and how to deliver it. As a university administrator, I learned the power of consensus to achieve the impossible. As a coach and trainer, I learned how to motivate through influence based on fulfilling human needs. The four psychological fears of Failure, Embarrassment, Achievement and Rejection can prevent our actions. We must learn to ignore the fears by learning how to respond to failure, developing emergency checklists. Then, with confidence, we can act without fear. A positive attitude is a perception of ability built upon thoughts framed with positive expectancy. Building consensus and confidence in others creates a supportive environment for achievement. Finally, a consensual plan is carried out with the confidence of community support and emergency checklists for handling unexpected setbacks.